MAJOR ANNOUNCEMENT: ANOTHER Huge Miracle On The Way! I’m excited, PUMPED, and STUNNED to announce that God has worked another miracle in our lives: We’re expecting another Sangl! Last month, we paid off our house. Just 13 days after paying that off, we find out that we have the blessing of another child on the way!!! Woo-hoo! Congrats Sangl family!!! Praise God! 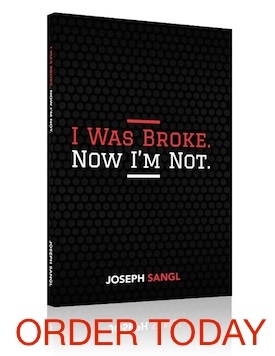 Wow… Congratulations to the Sangl family! That is awesome!! Keep them coming! Congratulations! Congratulations, Joe & Jenny!!! So excited for you! 🙂 Jesus is doing a mighty work in your family and I am celebrating with you!!! Fantastic news!!! All of God’s blessings for you and your family. Keep up all the good work you are doing. You have been a true inspiration in my life and I am very grateful to have discovered your site. Thank you all for celebrating with us! We are FIRED UP for a new addition to the Sangl clan.